bonds sold off hard on Friday and what could be the start of another leg down. let me digress for a bit .. 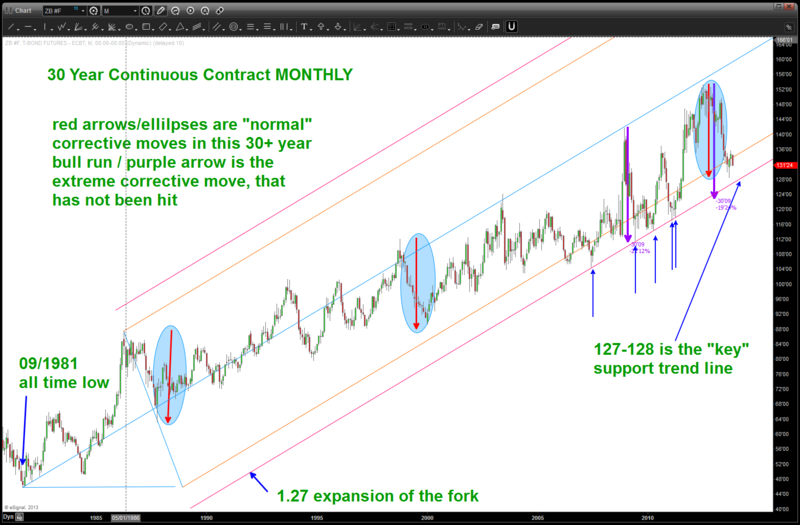 I LOVE Elliot Wave – when it’s easy to count. LOL – no kidding if you can pay attention to corrections and their form (flats, zig zags, triangles, expanded flats, double threes, etc) and live by the rules (3 can’t be shortest, 2 can’t go above/below the beginning of 1, 4 can’t go past the end of 1) you can get kind of dangerous at it. when I try to force a count it’s probably correcting or “the grid is shifting” and the count will, ultimately come to me. so, am I on a 5 minute chart counting every squiggle? nope … however, I do look for counts on monthly and weekly charts. back to fixed income … if we look at the low in the summer of 2009 we’ll see the next leg up on bonds (the last?) start in earnest. Wave 1 peaks out and, as you can see, I have labeled to areas where 1 might have finished. 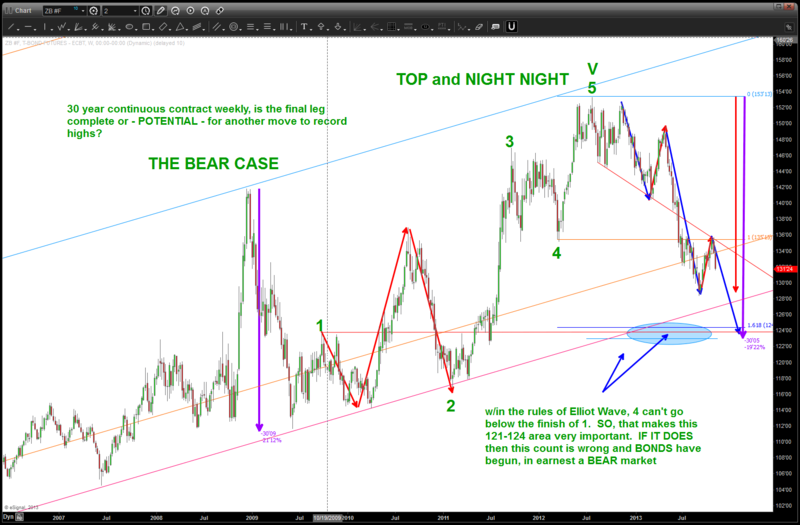 then we go down into 2 and then this is where it gets interesting … if we make (1) = 3 then the correction BLOWS THRU 1 and we have broke our rule so we have to sub-divide and then NICELY count (1), (2), (3), (4),(5) into the all time high and that high becomes 3. for me, it’s the only way that I can count it and NOT break rules.